St. Thomas, U.S. Virgin Islands. Staying alert, listening for the sound of the teaser going off and paying close attention to the crew’s direction proved the secret to success for Zachary ‘Zak’ Murck, of Davie, Florida. The fourteen-year-old angler released six blue marlin in three days to earn the coveted Top Angler prize in the 53rd Annual July Open Billfish Tournament, held July 17 to 19. That’s not all! Murck’s six fish was enough to land Never Say Never, the 58-foot Merritt he and his mother, Melissa, fished aboard as a team, the Top Boat prize in this Virgin Islands Game Fishing Club-hosted event. Murck will have his name engraved on the prestigious ‘Give Him Line’ award for Top Angler. The names of past winners on this perpetual trophy reads like a ‘Who’s Who’ of blue marlin sport fishing. Angler Elliot Fishman’s winning 845-pound catch in 1968 set an all-tackle world record. Only two anglers have reeled in this honor two times – the late Howard Crouse in 1965 and 1988, and Puerto Rico’s late legendary angler Ralph Christiansen in 1973 and 1984. The teenager’s road to this impressive trio of honors – which also included Top Junior Angler – started on the first day of the tournament when he released two blue marlin by early afternoon. This put both Murck and Never Say Never at the top of the angler and boat scoreboards right from the start. The second day, the bite heated up when all tournament boats scored releases. Yet Murck kept himself and Never Say Never on top by releasing another two blues. On the third and final day, in spite of a strong showing by teams on the 61-foot Garlington, Wave Paver, and 60-foot Rybovich, Pescador, which ended second and third Top Boat, respectively, with five blue marlin apiece based on time, Murck prevailed by releasing yet another two blues to add up to his winning six. “It was really exciting, especially on the last day,” says Jr Davis, owner/angler aboard Wave Paver, based out of Port Canaveral, Florida. 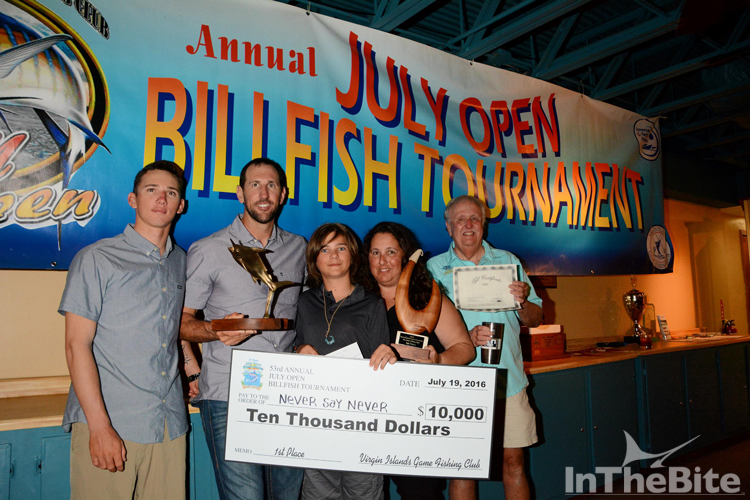 Wave Paver won Top Boat in the 2015 JOBT with seven blue marlin releases. 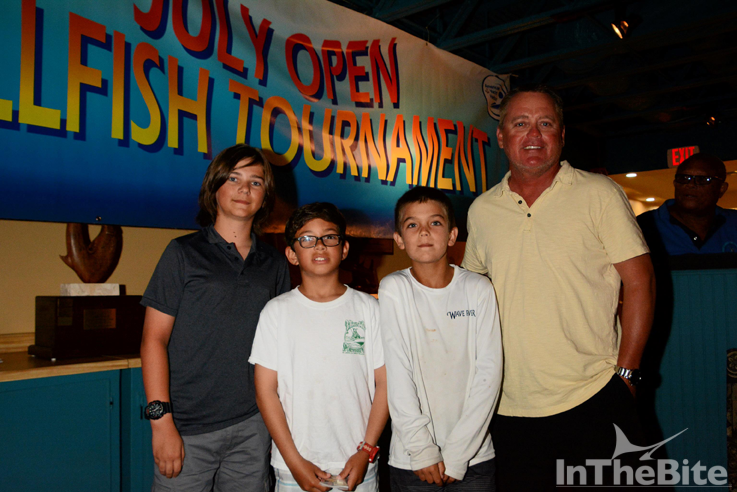 L to R: Zac Murck, Robbie Richards and 10-year-old Finn Sinclair (who fished aboard Wave Paver) receive David Wirth hook necklaces for being the tournament’s junior anglers. Not pictured: John Deckoff, another junior. Wave Paver and Pescador were briefly tied with four releases each by mid-day. Then Wave Paver’s Davis released his fifth blue first to keep the boat in second place. However, the real story of the last day was Pescador’s four releases. It was the highest one-day total in this year’s tournament. Added to the one release the day before, it gave Pescador a five fish total. All fish were caught by 17-year-old angler, John Deckoff, of St. John, USVI. Rounding out the fleet, Sodium finished fourth with three released and Mixed Bag ended fifth with two released blue marlin. Something remarkable about this year’s JOBT is that there were four junior anglers fishing aboard four different boats: Murck on Never Say Never, Deckoff aboard Pescador, 9-year-old Robbie Richards, Jr, on Mixed Bag and 10-year-old Finn Sinclair on Wave Paver. Each of these anglers was awarded a hook necklace crafted by marine artist, David Wirth. “This bodes well for the future of our sport and our tournament to have such talented young junior anglers,” says Dr. Craig Friedenberg, VIGFC member, as he presented the awards. The five boat tournament fleet, with 13 anglers, collectively released a total of 21 blue marlin. 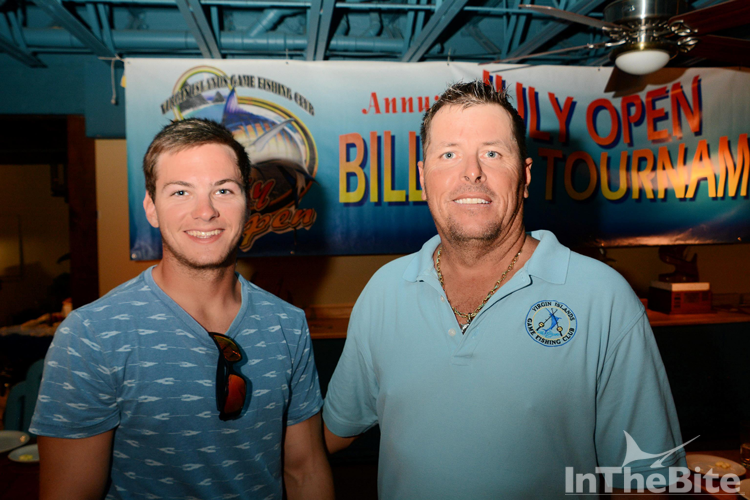 The JOBT is the kick-off for the new Virgin Islands-Caribbean Billfishing Series, which will continue and conclude this year at the Scrub Island Blue Marlin Invitational, in August, in the BVI. VIGFC members hope to expand the Series to include more tournaments in years to come. For more information, visit: www.vigfc.com or call (340) 775-9144. Or, visit us on Facebook!